Whitley's guest on Dreamland was Margaret Starbird. She has a new book titled "Mary Magdalene, Bride in Exile." It was a very interesting conversation. Afterwards Linda Moulton Howe updated us on horse mutilations in Colorado. As always you can stream this interview at Unknown Country. Henry asks about a connection between Mary Magdalene and Athena. Starbird says they both stand for wisdom. Talks about the wisdom of the feminine being ignored. Henry talks about the people of Tennessee spending 55 million dollars to build a 22 hundred foot rod laid out of 19 acres at the state capital. This rod contains a oak grove in the form of a pillar. He asks her why would this be important? Starbird isn’t sure they did that on purpose. Henry says they are being told it is all by chance and talks at length about pillars. Starbird says all kinds of connections maybe are being made by the unconscious. Henry tries to get her to come to Nashville to see the rod. Then he talks about Holy Blood, Holy Grail and how it changed his life. He calls The Da Vinci Code the son of HBHG. Wants to know why this knowledge is so life changing? Starbird thinks it is because the story of the scared bride and bridegroom resonates with every human. The story of life itself. It is what has been denied. What you are denied you long for. The knowledge was usurped by the church. Because we think Jesus’ mother was the only woman in his life is part of the reason we are dysfunctional. Because we deny the scared union. Henry says through computer imaging they have determined that George Washington was once a buff stud. Tells about a statue of him where he looks like a action hero. If by some miracle the temple was rebuilt and Margaret was in charge of creating a holographic movie of some portion of Jesus and Mary’s life, what would they look like? Would they be a buff stud and a Julia Roberts look alike or a docile nerd and a Asian beauty? How would she see such a scene? She is almost speechless, but says they would be gorgeous. She would have red hair and he would have brown hair, beautiful people. She doesn’t think of them as nerds. She doesn’t like the paintings that depict Mary as a prostitute. Henry says if he were doing it Jesus would look like Russell Crowe in the Gladiator and Mary would be Angelina Jolie because he thinks they meant business. I am ROTFL. Then he tells in great detail of how he would recreate a scene from the bible about the tower at Solomon’s temple. Starbird talks about a church of light. Something about a unicorn with fleur de lis coming out of its tail. Henry talks about watermarks and secret knowledge. Starbird talk about the esoteric stream coming out in artwork. Henry says it is all about recovering the great secret. Starbird wants to restore the union of male and female. They talk about the letter H, a tower and number codes. Too complex for me to say much about. Henry talks about a argument that broke out over dinner in France when a woman said Pam Anderson best represented the divine feminine. The other women at the table were appalled. She asks Henry who he thinks would be best representation he says Dolly Parton. The woman says she couldn’t be because she never had children, thereby offending the other women again. Starbird says it doesn’t matter whether a woman is childless or not to be a divine feminine. That is a load off my mind. Henry wants to know if Starbird has heard anything about Jesus and Mary having more than 1 child. She thinks they only had 1 child and Jesus died before it was born. Henry talks about Goddesses being represented by towers and pillars. What would a mystic religion of Jesus and Mary look like? Starbird, you ask some really interesting questions. It would take me a week to think about them. Short answer - honoring all aspects of life. Henry asks if there are things about her work that have improved her marriage? She has been married 35 years with 5 kids which is pretty amazing and she thinks her work has helped. Starbird ends by saying we are all partners with God. Here is my Whitley quote of the week - "We lost the oars while we were rowing towards God." I'm still thinking, but let me tell you something, THANK YOU ... for all your support. Really, you're a great gal. 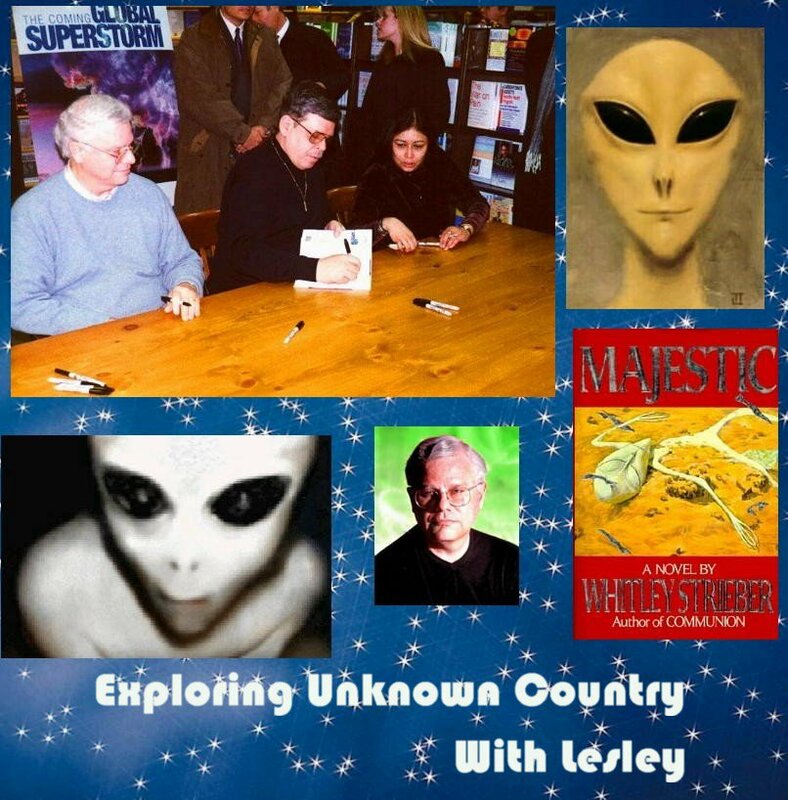 i stumbled onto your site and i saw the whitley strieber thing. if yuo like the communion books, then i think you should read "majestic"
you probably have already heard of it, but if you havent i think you should read it. its alittle more disturbing than communion for a number of reasons. i think you would like it. I have read Majestic and it is my favorite "alien" book that Whit has written. Whit tells me that his new book coming out in January called "The Greys" will be very similar.